I returned from India a month ago - it is always bittersweet to leave. 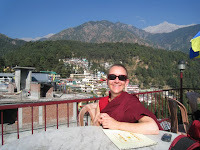 There are so many things I love about Mcleod Ganj (Upper Dharamsala) and so many things that I don't love. These lovely photos taken by Andrea show the magical side - lunch with a stellar view and the illuminated khora around His Holiness the Dalai Lama's temple grounds. As the calendar year changed, I made an internal vow to be more aware of complaining mind. 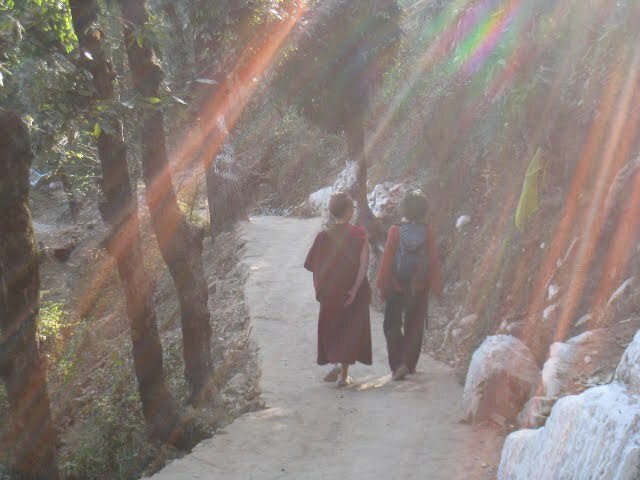 Having been around my Tibetan friends for nearly 3 months, I was struck by how little they complain or focus on negativity. In contrast, myself and other Westerners who come to the cafe seem to easily complain and almost enjoy it. But it leads the mind astray and creates mental ruts of self-involvement. No bueno! I dubbed this the Year of Mindful Speech. And there are two guideposts to help us stay on the path. WAIT = WHY AM I TALKING. and HAIL = HOW AM I LISTENING. This is not easy. Yet in the end it cultivates what we all seek - a happy, centered mind and connection with others. Will you join me in this aspiration to watch our speech, complain only when accompanied by insight and solutions, and listen to others from the heart? It is not about being sappy or sweet, but honest, aware, and thoughtful - both for ourselves and others. Complaining especially is a habit we can break; less complaining, more contentment! I wish you much peace, patience, kindness, and compassion this year. May our minds and mouths reflect our innate buddha nature.